So back to the blender and the Auto IQ. Sounds funky doesn’t it – I’m a gadget freak, so for me this meant it MUST be good! Well overall it is as simple as two preset programs to either make it ultra smooth or just smooth. BUT – worth having. The programs auto pulse which helps ensure everything gets blended and ice gets crushed (infact – just to mention, not ALL blenders will blend ice at all or even well. This does!). So you fill with your ingredients, screw in the blades and pop it onto the base and press a button. 60 seconds later your smoothie is ready and blended perfectly. Cleaning – well just rinsing under a tap and both the cup & blades came out clean. So a quick rinse is all that is needed, another big positive. The blender itself is rugged, the cups & lids perfectly good enough for the one a day smoothie wanna be. 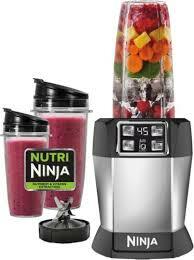 It’s quite powerful so makes sure everything you put in gets blended up nicely. So for anyone getting into blending, you won’t go wrong with this model. No pushing down to start it, the auto IQ programs do it all. Just twist in and press. It couldn’t be more simple! As for recipes, experiment – find the flavours you like then add in the “healthy” stuff. For me I’ve settled on the recipe below. What surprises me most is how FULL I feel after one of these. It really is a meal replacement (and considering I didn’t eat breakfasts – a healthy breakfast that only helps my body and an extra meal which is a lot better than eating just one!). I call it the Purple Monster – It’s purple and nearly a pints worth of goodness! Screw in blades, blend on the ultra setting and enjoy. Now I’m not going to throw weight loss figures into this, as I don’t know if it is BECAUSE of this or a combination of things. But since having these daily (for the past week) I’ve consistently been dropping weight. I think these ARE helping – but time will tell. But regardless I’m getting some good healthy food inside of me I’d not normally have! Summary – good blender, does what it says on the box. Experiment with recipes – don’t try one and not like it and give up. Add in fruits you LIKE the flavour of!!! Any questions – sign up and add a comment.